Purchasing power among U.S. Hispanics has been steadily increasing during the past two decades, and it’s expected to continue growing rapidly for many years to come. 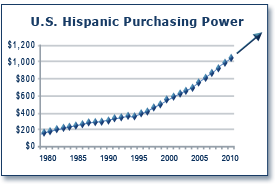 Purchasing power of Hispanics is predicted to exceed $1.5 trillion by 2015. In 2009, nearly 3 million Hispanic-owned businesses generated almost $500 billion in annual revenues. The number of Hispanic firms is growing more than four times faster than the overall number of U.S. firms.